Friday night, January 4th, the Alabama Hunter Jumper Association Membership gathered at Haven in downtown Birmingham to celebrate the 2018 horse show season. In 2018 many of our riders stepped onto new horses and into more competitive divisions. We are so proud with not only their ribbon results, but also with all of the new skills they honed this year. Our riders came away with top placings in the entire state of Alabama. In the Walk Trot 8 & Under division, Camille Coco and Whispering Hill took 7th. Camille also took 6th in the Walk Trot 8 & Under Equitation division. Lou Gidiere followed just behind Camille with a 9th place finish in the same division. In the Crosspole Hunter division, Bates Moody and Lydia Clayton shared the ride aboard Elliott for 3rd place honors. Bates also took 6th in the Crosspole Equitation. Bates was able to hold onto her 6th place finish even with moving up to the Short Stirrup division halfway through the year! Brynn Smith piloted Whispering Hill to 8th place in the Crosspole Hunters and Brynn took 7th in the Crosspole Equitation as well. Bates Moody (left) sporting Crosspole ribbons. In the Short Stirrup Hunter division, Hannah Banks was 3rd aboard Capito. Hannah also claimed Short Stirrup Equitation Champion honors! In Long Stirrup, Paloma Caine and White Tie took 4th in both the Hunter and Equitation divisions. Hannah Banks and her Short Stirrup Equitation Champion ribbon. Paloma and her parents celebrating her 2018 successes! In the Schooling Hunter division, Fox Lake girls took the three top spots! Sydney Velazquez and Double Dutch claimed Schooling Hunter Champion, Emma Grace Early and Wonderland took the Reserve title, and Lauren Velazquez and Caredan Z took 3rd! In the Pre-Child/Adult Hunter division, our girls took 1st, 2nd, and 3rd in the same order! The Schooling Hunter and Pre-Child/Adult divisions were the largest, most competitive divisions on the AHJA circuit this year; hard work and dedication all year long helped these girls pull out such impressive victories! Lillian Reynolds also had a great year in the Pre-Child/Adult division; she piloted two mounts this year which just barely kept her out of the Hunter division ribbons. However, her strong showing all year long in the Equitation division clinched her a 4th place finish. Lillian and Willie, her mount purchased in the summer of 2018, also moved into the 2’9 Low Hunter division this fall to much success. Lauren (left) and Sydney Velazquez with parents Romney and Andy. Emma Grace Early showing off her 2 Reserve Champion prizes and 5th place equitation ribbon with mom Lisa. Sydney Velazquez ended her night with a 3rd in the Pre-Child/Adult Equitation division; Emma Grace Early took 5th, and Lauren Velazquez took 6th. Trainer Guerry Force with the Pre-Children’s girls. In the Children’s Pony Hunter division, Sarah Carson Hill and Benlea Rain Dancer took 3rd out of a large group of ponies. Sarah Carson and “Stormy” had a great year together in Sarah Carson’s first year showing at 2’6. In the Regular Pony Hunter division, Mimi Colette Frei took 4th aboard Divide’s Freedom Spirit and Julia King took 5th on Copperfield. Both girls have since moved onto new pony mounts and we are sure they will have even more success in the 2019 season. Mimi Colette and Julia also took 4th and 5th in the Regular Pony Equitation division. Sarah Carson Hill (left) and Julia King with their pony hunter ribbons. In the Baby Green Hunter division, A.J. Salch’s Cambridge clinched 4th place with Carlyle Brown. “Ozzy” made lots of improvements this year as he learned to love his job in the hunter ring! In the Low Hunter division, Kate Knowles took a 4th place finish with Kingsley. 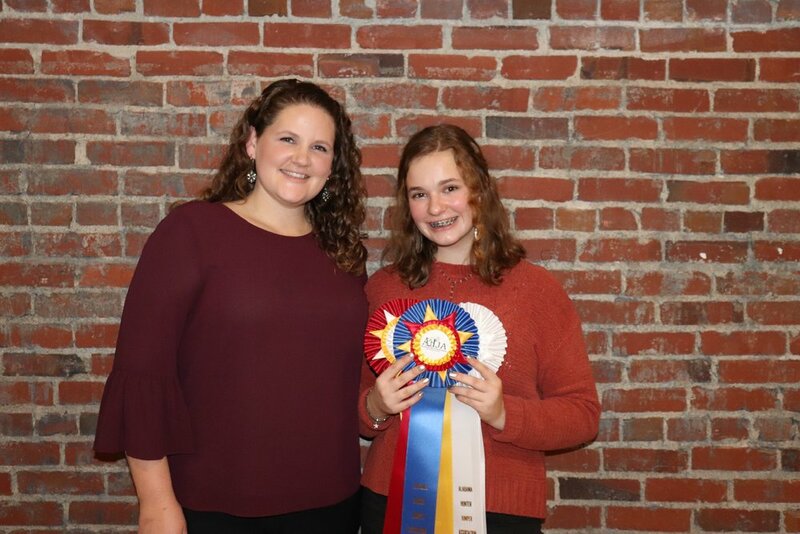 Kate and “Dax” also claimed Reserve Champion in the Children’s Hunters for the year, and Kate won Champion honors in the Children’s Equitation for the 2nd year in a row! Kate and Dax had a successful show year. The AHJA also awarded High Point Awards to those AHJA members who accumulated points in rated divisions at USEF shows throughout the year. Campbell Swanner and THS Pia-Lena had the highest number of points in the Children’s Hunter division at USEF rated shows out of everyone in Alabama, so they clinched a Champion prize. Annie LaRussa and Escalido were right on their heels, coming in 3rd. Campbell Swanner and mom Heather with Campbell’s USEF High Point ribbon for the Children’s Hunter division. Many trophies and awards were given throughout the night to deserving riders, trainers, and parents. During the Banquet, the AHJA Membership votes on those nominated for select perpetual trophies. One such award, the Pat Hoyle Sportsmanship Award, has been given since 1969 and is awarded to someone who exemplifies strong sportsmanship and dedication to the sport at AHJA activities. Guerry Force nominated Carlyle Brown for the award, and the AHJA Membership voted her as the winner. Carlyle’s name will be engraved alongside many cornerstones of the AHJA community, including Allison Black’s mother Mary Anne Majerik who won the award in 1988. Carlyle and Guerry with the Pat Hoyle Sportsmanship Award trophy. In all, it was a fantastic night for not only our Fox Lake Farm family but for the AHJA community as a whole. We here at Fox Lake love being involved in such a strong local circuit that is encouraging and bringing along our next generation of horsemen and women. Also, a huge thanks to the AHJA Board for their hard work this year ensuring a successful circuit, as well as lots of time and effort put forth to make sure Banquet went off without a hitch. Click through the gallery below for more photos from our fun night. Thanks Madison Massey! Older PostMerry Christmas from Fox Lake Farm!